In Nairobi, a gathering of dangerous terrorists is tracked by a daring local operative (Abdi). 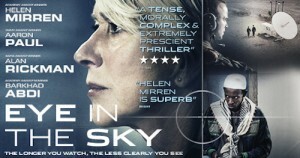 In London, military leaders (Mirren and Rickman – in his last on-screen role) urge reluctant politicians to authorise action. In Texas, a team of drone ‘pilots’ wait nervously to execute an attack that has considerable potential for collateral damage. A fine cast anchors this tense and disturbing exploration of the process and ethics of modern warfare.